Once upon a time, so long that I can’t possibly remember, there lived a little African girl who loved books. Somewhat timid, she loved the hours spent in the company of her books. Whenever she could spare a little time from her chores, she wrote her thoughts down in a blog. Now, this girl was like an English aristocrat for her sticking to the old time-tested customs. She staunchly believed, for example, that books could only be read in the paper format. Before she could say Jack Robinson, she was hooked. Kindle became to her like an irresistible magnet that devoured all the reading time she had. Well, sometimes she also used other time that was not reading time to read, but that is another matter. She fancied that she loved reading, but kindle just re-kindled her favourite pastime. Pride and Prejudice, The Three Musketeers, Little Women, Memoirs of Sherlock Holmes, Wives and Daughters, A Christmas Carol, Adventures of Sherlock Holmes, The Small House at Allington and so on and so forth. All that in a few months! It is no wonder that she doesn’t have time to jot down her thoughts nowadays. She is too busy learning French and reading, of course on Kindle. It has been a long time since I last updated this blog. My sister Phui has kindly called my attention to this fact. Talking of my sister, she has also recently given me a book for a gift, knowing my love for books. Thanks a lot dear sis! 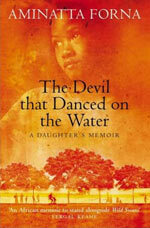 The book is entitled “The devil that danced on the water” by Aminata Forna. It tells the story of her search for the truth of her father’s fate, Mohamed Forna, who had been told that for Africa “politics and violence are inseparable”. Her father abandoned his medical career to enter into the volatile politics of Sierra Leone in the 1960’s. A brilliant and impeccable man, he became finance minister under Siaka Stevens, the then president. As I am still reading the book, a complete review is impossible at this point! But a promise is a promise, a review is coming once I have finished reading. At least I owe that much to my dear sis! You are my sunshine, my only sunshine, you make me happy… So goes a song I faintly remember from childhood. Savindi nominated me for this award, and I feel I could sing this to her! What Is Your Favourite Childhood Memory? Waking up on Saturday morning to the smell of chips and sausages that my mum would prepare for our breakfast. A perfect recipe for a full day’s garden work: weeding, planting, manuring, name it. We grew potatoes, carrots, maize, beans, kale and everything that could sprout! What is a real fear you have? FAILURE!!! How would you describe yourself? Discreetly funny, with a few very good friends that last for a lifetime. Definitely not a party girl, rather the book-worm type (mainly novels) Haha!! What Countries have you lived in? I have lived in Kenya most of my life, but also in Uganda for one year and Italy for three years. What is your style? comfortable with a streak of ethnic. I think that cotton is the best thing that happened to humanity, after the wheel and sliced bread. What is your favorite breakfast food? Anything goes, as long as there are no eggs! What are some of your hobbies? reading, reading, and more reading!! If you could tell people anything, what would be the most important thing to say? Follow your heart, but listen to your head too. What is the one truth you have learned? No situation, however wretched it seems, but has some sort of comfort attending to it.